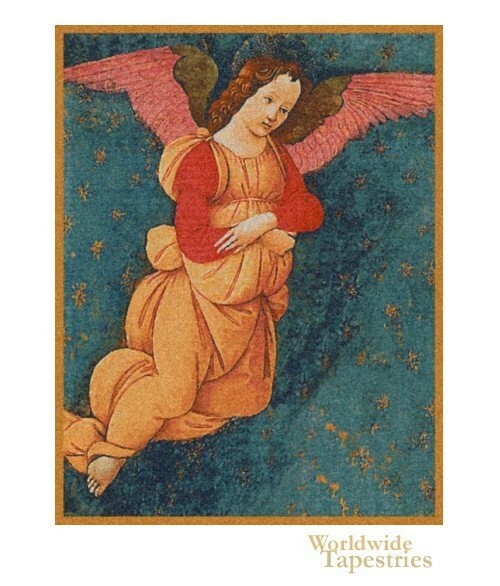 This religious Renaissance tapestry "Angels (Altarpiece Vertical)" shows an angel in flight. Here we see the angel in saffron yellow robes, symbolic of wisdom. The starry sky in which she flies is a beautiful blue. This religious Renaissance art tapestry "Angels (Altarpiece Vertical)" is lined and has a tunnel for easy hanging. Dimensions: W 29" x H 37"